These disposable seat pads offer protection for furniture and keep the user comfortable. 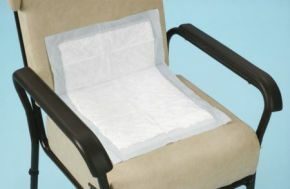 Liquid is quickly diffused throughout the pad, ensuring the user stays dry. A waterproof backing prevents any leaks onto the furniture. Size 600mm x 400mm (24" x 18"). Supplied in a pack of 35.